Their strategy to man-mark Messi while the rest of the team shifted towards the ball zonally (without access) was the key to their undoing. Messi’s intelligent movement to manipulate his man-marker’s positioning and a crazy solo-run goal resulted in the 3-1 victory for Lucho’s men in the final. The basic shapes for both teams in the match. The game began promisingly for Bilbao as they played in a compact 4-4-2/4-4-1-1 shape and looked to control the center to force the play to the sides of the pitch and congest the space there. Athletic Club players get tight to the Barcelona players when pressing against the sideline. When the ball was forced to the side, Athletic Club’s second striker (Williams) dropped onto Busquets to prevent Barcelona escaping the congested space on the side of the field. 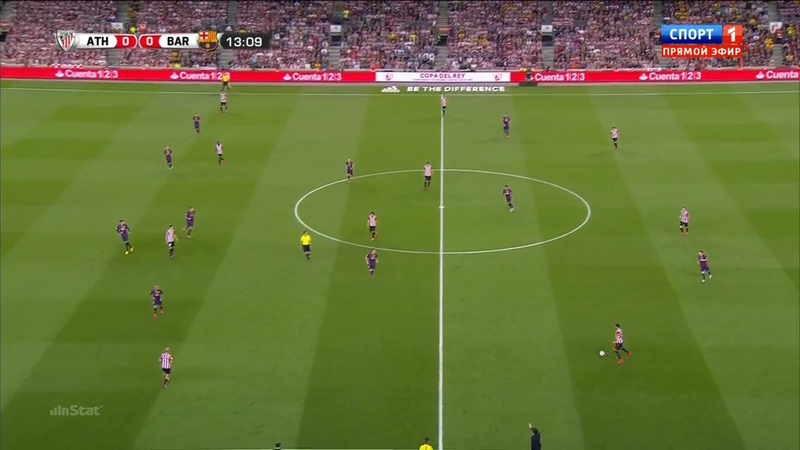 Notice how the rest of the midfield shift compactly towards the ball and the striker (Aduriz) looks to press the passing lane between the back line of Barcelona to keep the ball to the strong side of the defense – similarly to what Williams is doing to Busquets and the Barcelona midfield. Bilbao’s near side central midfielder man-marks his opponent in the congested space in order to have immediate access should he receive the ball. 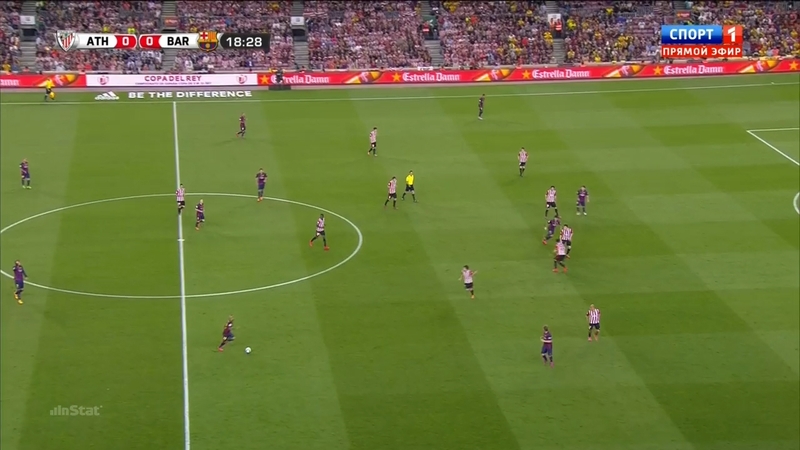 Overall, it’s not a bad defensive scene for Athletic Club in regards to containing Barcelona, but it could be better. The player on the ball has an immediate option next to him in Alba in order to escape the pressure (even though Alba is a bit too close to ball, Xabi Alonso-esque of him!). Barcelona didn’t have difficulty switching the ball out of the defense’s strong side. Ultimately, Bilbao only forced Barcelona to switch the ball through their defensive line with some longer passes instead of switching through the midfield – which wouldn’t be so bad in itself had Athletic Club had a more intelligent process for dealing with Messi. Here we see a bit of a problem when Rakitic makes an unusual movement while being man-marked. This destroyed Athletic’s defensive structure. Similar to the previous scene…but slightly different because of Messi. 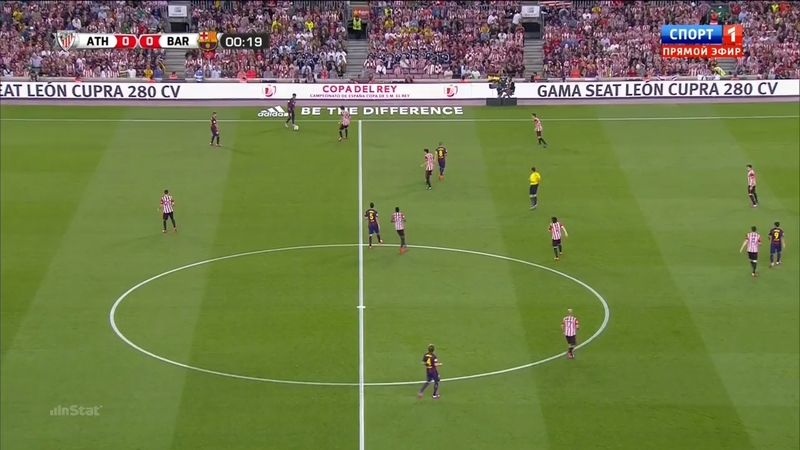 It isn’t easy to tell from this picture, but Messi is being strictly man-marked by the Athletic left back (Balenziaga), which is fine as Balenziaga is pressing Messi in a space that a full back would normally press a winger. So, the rest of the defense should have an easy time shifting across and congesting the space, right? Well, Barcelona’s right flank is a bit different to their left one in regards to movement. Alves moves into the halfspace, Rakitic moves diagonally towards the flank, and Messi begins on the touchline but moves into the center from there. Rakitic’s unusual movement dragged Benat away from the center of the field (which Bilbao wanted to control) and Alves’s movement into the halfspace wasn’t followed by Bilbao’s left winger – partly because Messi was moving inside off of Balenziaga with his body between the defender and the ball, but also because it would have been awkward to follow Alves into that space. Because Messi is so difficult to press, Bilbao couldn’t stop him from playing Alves into the space which was opened for Rakitic. From that space you could easily imagine Alves playing one of the 3 Barcelona players forward there, no? Iniesta’s movement higher up actually occupies the Athletic right back, while Suarez is occupying the right central defender, leaving Neymar free on the far side. It’s a dangerous game when a team moves compactly towards the ball but can’t control the opponent. This image is great, the closest player to Rakitic is the left central defender – how did that happen? This is another example of why the largest portion of Barcelona’s attack came down the right side in this match. Alves is in the middle of the center circle and Athletic’s right winger (Rico) was hesitant to move there, but did so anyways to an extent. Messi moved completely into the center while still being followed by Balenziaga – meaning Balenziaga, the left(!) full back was now further to the right than the right central defender! 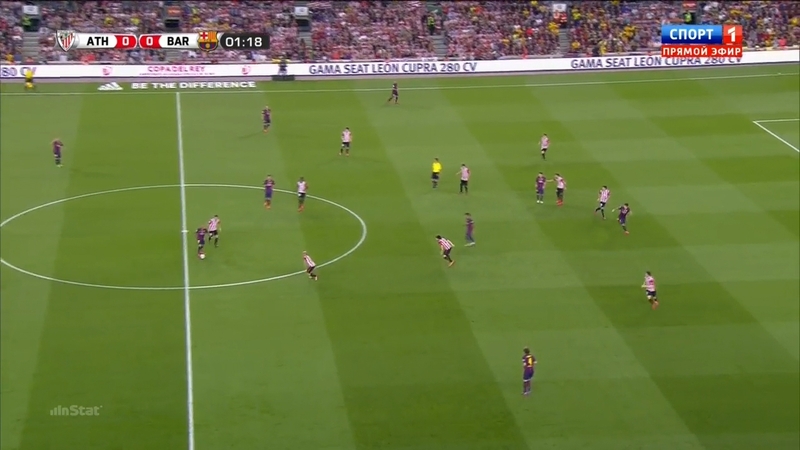 Neymar helped to really expose Bilbao’s defensive setup in this scene. He is the player in the center next to Benat, and he isn’t being followed by his full back, who is marking space on the far side of the field with Alba against the touchline. Neymar drifted far enough towards the right side of the field that Benat had to move towards him and mark him – but where is Rakitic? Rakitic moved completely out towards the flank knowing that any central midfielder who is sane wouldn’t follow him that far wide and vacate the center. This left Rakitic completely free on the right flank with the Athletic left central defender being the closest player to him. These types of situations arose throughout the match and Suarez would immediately make a run towards the left half-space on the blind side of the left central defender while Rakitic dribbled directly towards him. This created a 2 vs. 1 situation and even resulted in a 1 v 1 situation for Suarez against the goalkeeper. The right central defender was hesitant to press Suarez across the pitch into the left side and vacate his space – which is understandable given the amount of runners Barcelona normally have on the far side of the field. Rico looks to support Benat in the center as the ball is being switched this time around against Neymar – but he has two opponents? This scene doesn’t look as bad for Athletic Club – which was normal when the ball moved towards the left side for Barcelona as they didnt have such a crazy/strict man-marking scheme on any single player, only situationally when pressing the ball. The same problem is still there though – they cannot prevent Barcelona from switching the ball through their back line when they force Barcelona to the more stable right flank (defensively). Neymar again occupies Benat, but Alves moves into a position which is normal for a fullback, so Rico shifts towards the ball to congest the space in the center of the field in a normal fashion. Balenziaga is still man-marking Messi who is quite central as he is pretty much in line with Benat of Athletic Club. 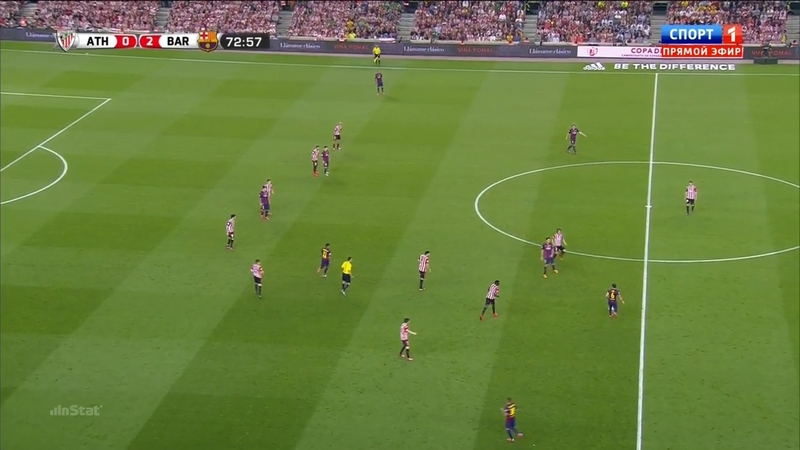 The problem once again is that Rakitic moved away from the center and towards the flank opened by Messi. Rico is in a slightly better position to deal with the far side if the switch should happen – but he has Rakitic and Alves to deal with. The switch will occur and one of Rakitic or Alves will move with complete freedom into the penalty box. Athletic’s strategy in transition is obvious here. Bilbao’s strategy in transition (and in offensive organization) was to break down the flanks behind the fullbacks before attacking the far post. This happened almost exclusively down the left flank because of Alves’ movement where he moved away from the flank and into the center, while Alba had a more linear role down the left flank. Williams and Aduriz ran away from the ball in attack and towards the far post. Rico would be supported by Benat and Balenziaga down the left in an attempt to create some space to lift his head up and play a long diagonal towards the far post against Alba. This isnt a terribly inefficient strategy to attack Barcelona because Alba is probably their worst player in the air. The above situation actually ended with Adruiz barely touching the ball with his header and forcing the ball out of bounds even though Williams had fronted Alba and was open for a direct header on goal – which likely would’ve yielded a goal! But, thats the type of play a team must live with when focusing on long and high crosses. Athletic in attack. Notice how Busquets has positioned himself! Barcelona’s defensive shape looked more like a 4-3-3 in this match than the usual 4-4-2/4-1-4-1 asymmetric defensive shape we’ve seen from them recently. Here, Messi missed intercepting a pass from the left central defender to Balenziaga. Barcelona then proceeded to move into their usual 4-4-2 shape with Rakitic filling the right flank for Messi as Busquets and Iniesta moved into central midfield and Neymar on the left flank dropped into the midfield. Busquets’ positioning is due specifically to Bilbao’s strategy in attack. They normally look to play long passes into their strikers and knock it down towards their wingers who then seek to attack the far post with crosses. Athletic will also play diagonals towards the flanks when in possession in hopes that Rico and Iraola win the ball against Alves and Alba in the air – notice how Athletic’s strategy involves more low percentage aspects in comparison to Barcelona’s, that probably has a lot to do with the match control and the scoreline. Busquets stood just in front of the central defenders in order to provide some extra support for the long and high passes into the Athletic strikers. The basic idea is that he overloads the situation in Barcelona’s favor so that the already low percentage form of attack from Athletic is even more likely to result in Barcelona winning the long pass down the center. In this specific situation he just moved higher and towards the ball once Messi was bypassed and Lucho’s men had no problems stabilizing the situation. Barcelona pressing well against the flanks. This image shows how much Barcelona have improved defensively since pre-January. 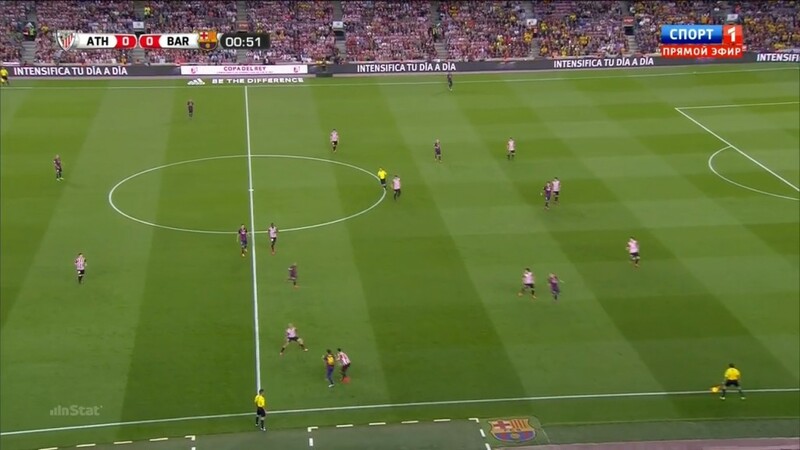 In the beginning of the season against Bilbao, Barcelona played in a narrow 4-3-3/4-3-2-1 where they struggled to establish access to the flanks and press them. Here we see Barcelona shifted towards the ball in a compact manner and with great access to the ball – they forced a long pass back to Bilbao’s goalkeeper in this specific situation. Messi is past the halfway line and protecting the center of the pitch, Iniesta, Busquets, and Rakitic are pressing all near side options for the ball while also congesting space. Suarez has the near side central defender in his cover shadow and even began moving towards the ball to help Neymar press. 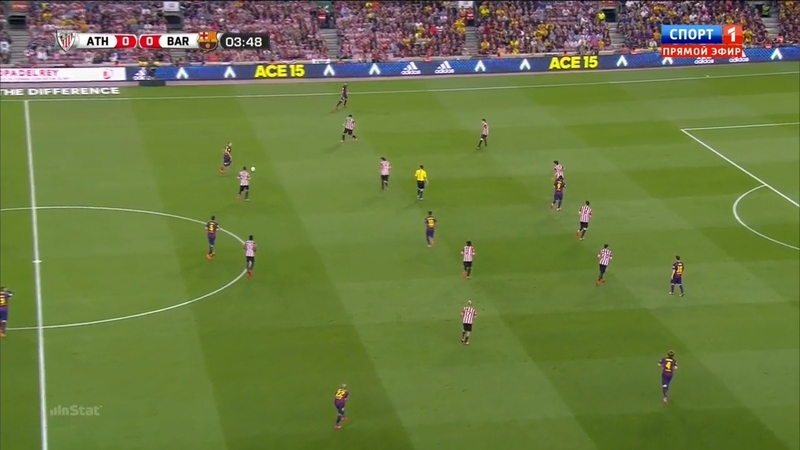 On top of that, Alba has stepped out of the defense to support the near side press and cover any pass down the sideline as well as helping the team congest the area. The rest of the back line shift towards the ball while forming a situational back 3 and covering all 3 Athletic forwards. Lucho’s team has improved defensively greatly since the beginning of the season. The change of strategy which moved Messi towards the right flank was not only great for the team offensively, but it fit them perfectly in defensive phases as well. This scene is a testament to that. To finish off I’d like to show 2 extra scenes from the game which further illustrate why Barcelona had such a dominant victory in the Copa Del Rey final. Here, Alves receives the ball off of a switch into the half-space while Rico decided to leave him and mark Rakitic instead. I’m sure we can all understand Rico’s thinking here, as Rakitic has been the one player who was left completely free for most of the scenes. Benat begins coming out of his position in order to apply some pressure on the ball and stabilize the high line which Athletic have – because a high line without pressure on the ball is huge trouble. Balenziaga has totally lost Messi somehow and realizes it exactly at this time, so he begins sprinting towards him. The problem with that is when a player is occupying a position his teammates will orient their positioning in part to their other teammates’ positions – so a defender is expected to cover the position which he is in and the rest of the team choose different spaces around the same area to defend. This is simply one of the four reference points of the game (the ball, teammates, opponents, and the space). So, when Balenziaga decided to leave his position and ran in the opposite direction of the ball towards an area which was already being marked by his teammates, he opened a huge hole in the defensive line and unbalanced the defense. Suarez noticed this and made another diagonal run from the blind side of the left central defender into the right half-space, where Balenziaga’s teammates had set up in in a structure where they believed that space to be marked. Alves played the ball directly into the gap for Suarez and Suarez was into the penalty box immediately – unfortunately for him the referee called the play back as it was decided that Suarez fouled the left central defender in his run. The situation leading up to the third goal. 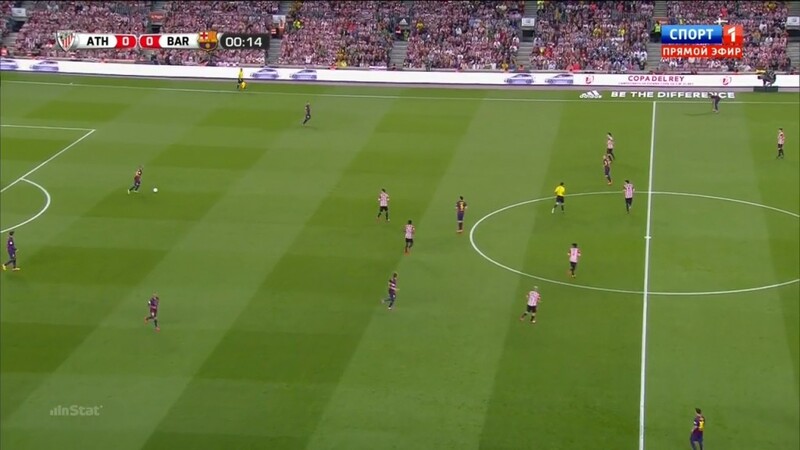 Xavi manipulating the Athletic defense. Xavi ran all the way from the right side of the field towards the left during possession and began playing passes between himself and Busquets in the right half-space in order to lure the Bilbao defense towards the ball and open massive amounts of space. Such combinations in a half-space normally have a space-opening effect, but this was made even more drastic due to Athletic’s poor defensive strategy. Once again, Rakitic found himself completely free on the right side of the field. Once Xavi received a return pass from Busquets he curled the ball into Rakitic with his first touch. This type of game control, manipulation, and decision making is what the world is used to seeing from Xavi and it was fitting that he played a large part in the three goals for this final. After Rakitic received the ball, he played Alves through the defense and into the box where Alves played a cutback pass into Messi who finished off the move. In the end, we must ask ourselves one question: Why? Specifically, why on earth did Dani Alves do that to his hair?! On a serious note, this was an incredible match from Lucho and his players. It was in mid-February in my analysis on the 5:0 victory over Levante that I first mentioned Barcelona could have a possibly historic season. The team has improved both offensively and defensively under Luis Enrique to the point that they could easily be considered the best team in the world. They have one last match left in their potentially historic season, and it’s against a very good team in Juventus. Juventus have also just secured a double in Italy and will be fighting to win the treble against Barcelona in the Champions League Final on June 6th. Whatever happens in that match, it will definitely be an exciting game! Hi Adin. Are you going to be doing a preview of the UCL Final? I think Barca can be challenged if opponents play with 2 strikers. Malaga who played 442 earlier this season won 1-0 at Camp Nou. Same as Bayern in both legs. A 4312 (kind of) in Spain and 442 at Allianz. So I expect a very close game unlike many others.